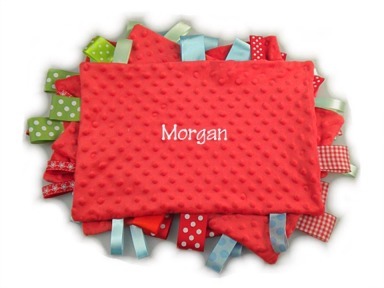 Little fingers love the feel of all the different textures of our Tag-Along Blankets. They're fun to snuggle and cuddle with, and because they're child size, the kiddos won't trip all over them. They measure approximatly 12" x 15". Because they're hand-made, the ribbons may not always be the same as those pictured. Babiy's name can be added giving customers the option of a personal gift. Orders placed for personalization will be shipped to your store within two weeks and cost just $7 per personalized item (shipping included). Provide a higher level of customer service with our Personalize It! program. This program includes Point-of-Purchase signage and literature that advertises the personalization option to your customers and keeps them coming back to your store for inexpensive personalized baby gifts. Easy-use order forms and website ordering make placing orders simple and convienient. Contact us for details.